Sources also confirm to Kotaku that the handheld will have dual analog sticks. Sony's game controllers traditionally have dual analog sticks, but the current PSP model does not. Dual analog sticks would bring the PSP controls more in line with what gamers experience on Sony's home consoles. Sony set the PSP2's goals (what Sony wants it to do), but is still tinkering with the portable's innards. The PSP2's tech specs are expected to change, meaning that things like chip size and processor size are variable. 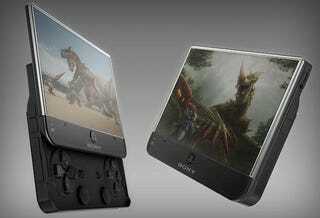 What's more, the hardware Sony showed was "temp hardware", so the final design is expected to change. Apparently, Sony has privately shown two versions of the new PSP. One version slides open like the PSPgo, and another version is similar in shape to the regular PSP. These are prototypes, because Sony has yet to finalize the PSP2 hardware design. Sony did not offer a comment in time for publication. Update: Sony replied, stating it did not comment on rumor or speculation. NOTE: The above image is not a picture of the new device just one of many fan-created mock-ups of a new PSP.